Many years ago, before becoming a Wilton Instructor myself, I was a Wilton student for a few months. This was in 1998, when it was just courses 1, 2, and 3, before they really did much with rolled fondant and long before they added the Fondant and Gum Paste course, which has been relaunched as Gum Paste and Fondant as of last summer. Back then, in Course 3 we dabbled a little in rolled fondant by making a clown face cake using brightly-colored fondant cut-out shapes, but I don't have a picture of it, and it wasn't all that great anyway. We also made a fondant heart cake topper during the second class to use on our final cake, which was a two-tier separated by push-in pillars. Apologies for the shoddy cropping. I had this photo in my scrapbook and tried to cut out as much of the background as possible. There's really not a LOT wrong with this cake, because I copied it from the back of the student lesson plan, which is evidence of my lack of creativity and imagination, but also was the easy answer since I was working full-time and really couldn't be bothered to come up with anything original. Anyway, there is a lot going on with this cake, and most of the techniques are no longer taught in the Wilton four-week courses. This is mostly because they're outdated and nobody wants ruffle borders on their wedding cakes now. 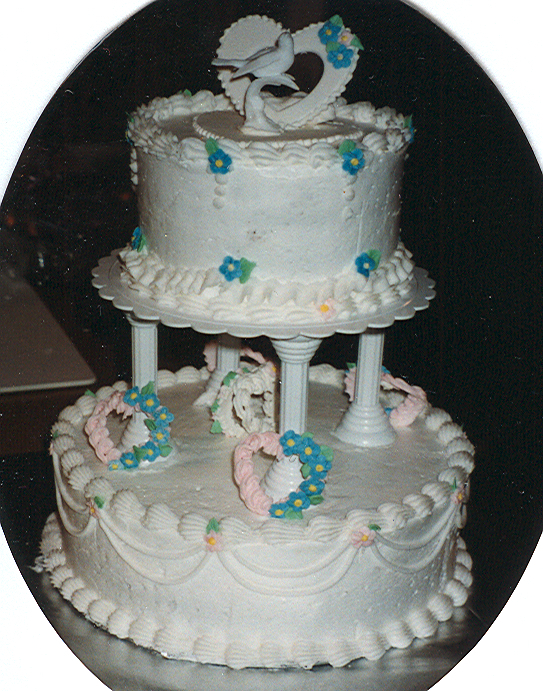 Thanks to the popularity of rolled fondant and brides preferring more modern designs, string and frills got dropped so that there would be time to teach the latest techniques (that Wilton incidentally had cool new tools for), but still it's a shame. The hearts on the bottom tier and all the little blue flowers (I think they're forget-me-nots, but I can't remember) were piped with royal icing. The topper is made from two hearts cut from rolled fondant, and in the student kit we got that dinky plastic dove. There were also some plastic beads that we were supposed to attach around the heart, but I piped a bead border with royal icing instead. The bottom tier also has shell borders and string work, and overall I'm pretty happy with it. The top tier is a six-inch round chocolate cake--which is obvious thanks to the crumbs, grr!--with a shell border around the top and shells with ruffles along the bottom. There were also strings on the sides of this cake, in between the drop beads, but for some reason they didn't stick very well. When I got it back home, half of them had fallen off, so I just took away the rest rather than pipe more. I'm lazy that way. This was the first tiered cake I ever made, and for the most part it's not too bad. Still, there are a few things that, in hindsight and with the eyes of experience, I should've done. You can probably figure them out, and if you see anything I've missed, feel free to mention it in a comment. I can't remember, but I think I used one box of cake mix for each tier. That's why the top cake is so much taller than the bottom. Ideally, unless you're doing something whimsical, tiers should be uniform in height. I should've either trimmed the layers of the top tier down, or used a box of cake mix for each ten-inch round layer. Thanks to the camera angle, this isn't a terribly obvious flaw, but I know it was there. I should'n't have used chocolate cake on that top tier. See the crumbs showing through? Yeah, chocolate cake is a nightmare to ice with white icing. Unless it's frozen solid, and even then it's a pain. What was I thinking? I really hate the topper. I wasn't crazy about it back then, but I can't stand it now. It looks cheap and cheesy. I should've done something else. Exactly what, I don't know. Any thoughts? I shouldn't have cropped this photo. At least, not like that. Okay, so there you have this week's should've done Sunday. Feel free to chime in with anything else I may have missed. I can see what you mean and where you might be a bit hard on yourself, but to me that is amazing and way beyond my capabilities. You pastry folks amaze me and please keep doing so because I love to eat your creations...yum! Though it looks like a simple wedding cake it looks fantastic.